With the death of Mario Bauza a couple years back, the top Afro-Cuban jazz band today in the U.S. is the Bay Area's Conjunto Céspedes. Sure, Poncho Sanchez is top-flight, Mongo Santamaria is still around, and even Bauza's beloved Afro-Cuban Jazz Orchestra is still playing without their late leader. 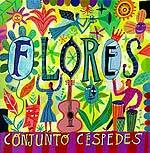 But Conjunto Céspedes' third CD, "Flores," establishes them as the top of the heap  just as Bauza was clearly the best with his three late-in-life albums for Messidor in the early '90s. As with Bauza's band for his final (and only!) three recordings as a bandleader ("The Tanga Suite," "My Time is Now" and "944 Columbus"), Gladys Céspedes' combo has a sense of style and mission about its albums that set them apart from anything else going down these days. It's the tight horn charts and arrangements, but more than that. It's the absolutely self-assured vocals, with Gladys' knowing asides. But more even than that, like Bauza, Gladys and her nephew and co-leader, Guillermo Céspedes, have a vision for their band, a musical voice they seek. They know what they want to achieve, and they've assembled an ensemble of musicians talented enough to put it all together. The result is music that absolutely cooks. Like the Basie band at its best, there's a driving rhythm section that propels the music, constantly pushing it forward. The horns hit their notes like percussion instruments, Gladys' singing holds you in its grip, and eventually the whole experience takes you in like the ocean swallowing a drowning sailor. And if you've any pulse at all, as soon as the last note drifts off you pop over to the CD deck and hit "play" one more time like the addict you've become.